It was a muggy but warm day in London, what else to do, but reach to the skies! 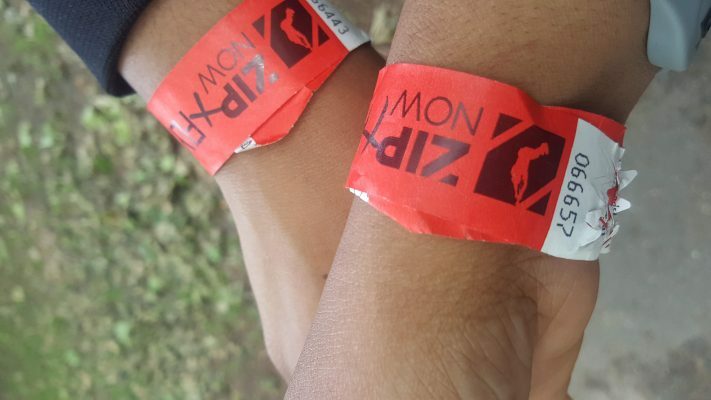 Today, we at Valuemytime, visited ZIP London, the biggest and fasted Zip Line. As you walk to the check in tent, you hear screams of joy, of the avian humans going across your head. There is a few chuckles , but the moment you look up to the trees and realise that, YOU will soon become that avian human. Not to worry if your mouth starts to dry at the thought, there is a nice little cart to pick up water from next to the registration tent. We arrived 30 min before our slot as stated to do so in receipt of the tickets. This is to run through the health and safety bits. Be prepared for height to be checked and you will be weighed!, no one else can see,just the one staff member, nothing to worry about, This is just to make sure that you are not over 19st or 120kg as that is the rides maximum weight allowance. 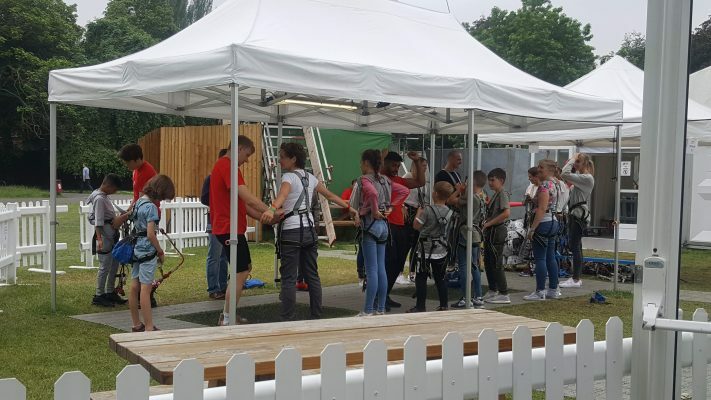 What was great to see was the adults (including us) thinking what was we doing there, while the kids pre – signed up with eager for a second ride, which only costs an additional £10 on the day.- Although a child friendly ride, there is a height restriction, that you should check ideally before booking. Zip London thought of everything. After booking in, the height and the weighing in, you then go into a small room with fellow riders to watch a brief health and safety video, running through the do’s and dont’s of the ride. There is a bum bag handed to you if you wish to carry your phone to the top and take photos of that view of all the way down there…For small bags and maybe a small jacket limited lockers are available for you to leave your items in. 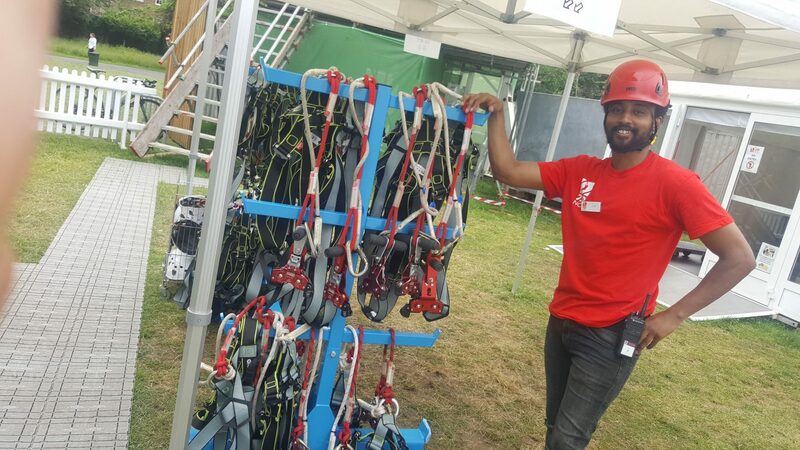 So as you wait for your riding team to assemble, remember that water we mentioned earlier to rid that dry mouth, well by the time you have again thought of all the reasons why you shouldn’t be doing the zip line, you probably will need the loo. Zip London, have toilets specially provided for such an instance. Our advice is just go, even if you think you don’t need it…no need to remind you, but its a long way down and actually a long way up with 184 stairs, but we will get back to that later, just use the toilet beforehand. Team assembled!- Ready to fly! ..Ok, there is something before that , the harnesses of course! – Zip London staff, assist us in getting us all harnessed up, nice and tight. Can I say, surprisingly quite a flattering look to be honest, which was a bonus we wasn’t expecting. 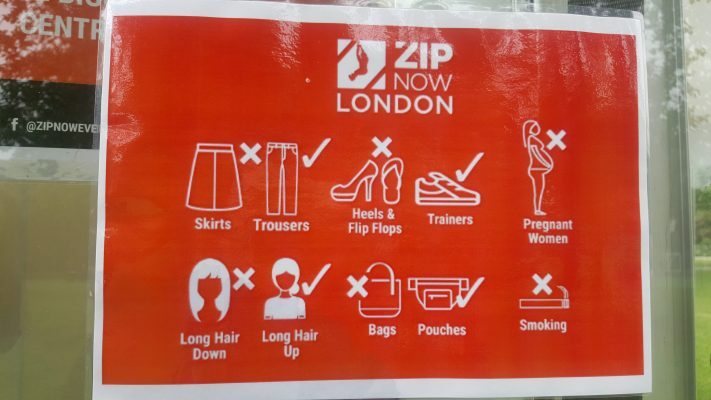 Expect a few tugs on your nooks and crannies, but its gotta be done, Zip London have to be commended on their health and safety focus throughout. No turning back mode kicks in as you march across the park in a 2 minute walk to head to the starting point, where another staff member greets you, checks you over again, and marks your wristband as another checkpoint. The mark of no turning back. So then all the way up you go!… up the spiralling staircase of 184 steps. Hitting the ear it does not seem alot, but hitting the stairs seeing high above the trees is a little bit different. Then there is a light at the top of the green tower..we made it.. we are at the top! 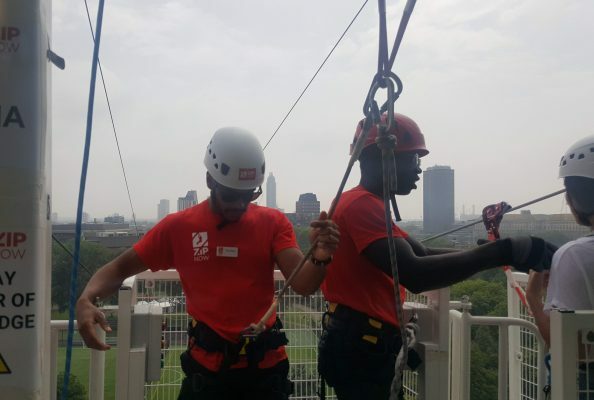 As you wait your turn, now is the time for that phone secured in that bum bag you had, to take in the view and take photos, as while you are zip lining, phones and recording devices are not permitted, both hands are needed on your cord for safety. 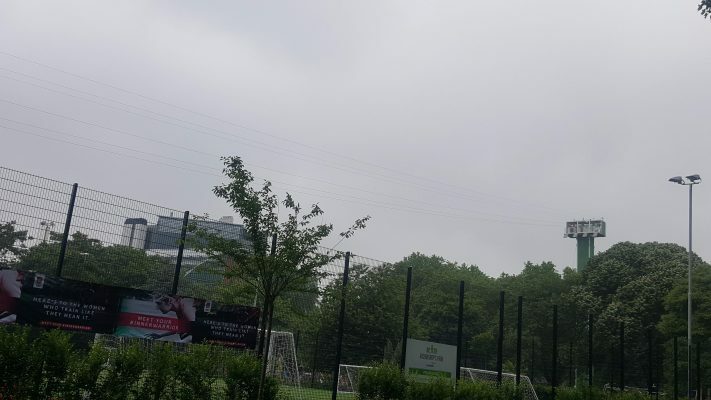 Now is probably a good time to mention if your going in a group try to go in an even number , if possible, its not mandatory, but the ride must take place in twos and unless there is another odd number group your ride could be slightly delayed. Luckily for one odd numbered rider, a staff member was due a lunch break and he zip lined his way down with him. How cool is that, you zip line down to lunch, how many of us can say that? 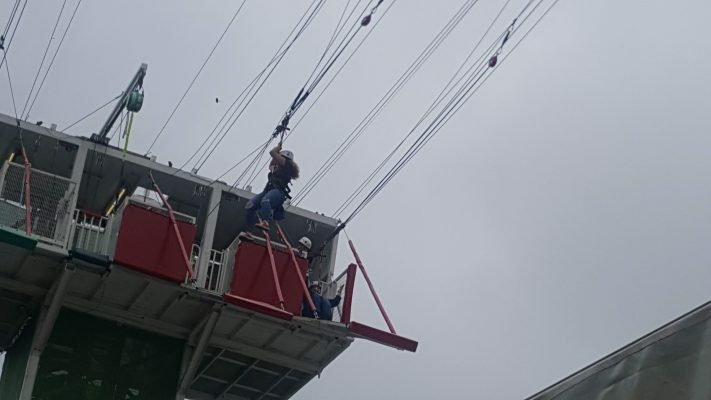 Finally, it was our turn.. the wonderful staff keep talking you , full of banter and your calmed by their friendly attitude as the are once again checking you over and the zip line is being attached. The staff swap over to check each others work and you again. Its strange at being how high up, and you feel safe at this point… Until they ask you to go through those stair gates and go down the stairs that seem to be mid-way between Archbishops Park and heaven. Before you can fully process that thought, your counted in and in our case cheered on by our other flight group and your off! – The first drop is the hardest, its cliche but just don’t look down not until your more into swing of the zip line. The feeling is a feeling you won’t get doing anything else. Whether your looking at the seemingly level sight buildings of London or the ant like people below you, you will only get this view from this ride. In this case we even had a 360 view as we spun round half way through, but even that felt amazing. Reaching the end, depending on what package you have booked, you can choose to miss the steps on the way down and mega drop, like a mini bungee, or just simply.. take the stairs. All in all, the ZIP London experience is an hour an a half including your half hour registration, but we went on a quiet day so be prepared for longer if you go in a busy period. 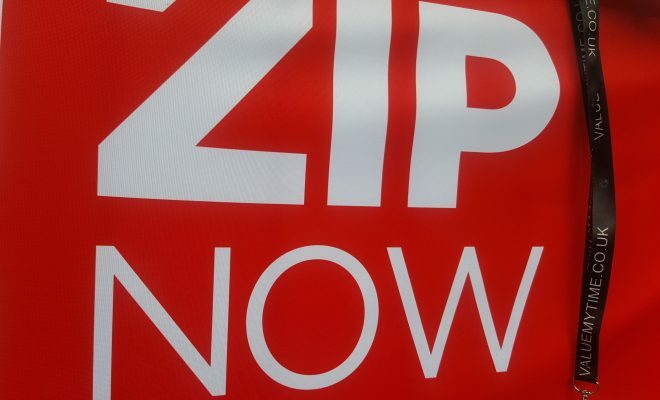 We would like to thank Zip NOW for their fantastic activity and their amazing staff especially, Hussain, Jon, Micheal, Ruben and Shaz. Great characters for settling you in even if at first you are unsettled. 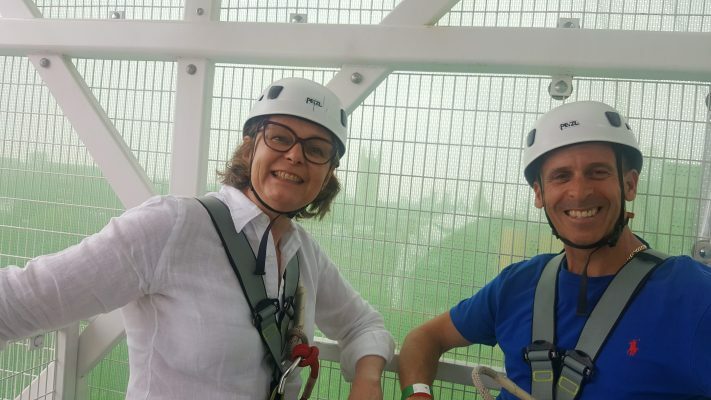 Please note: Zip Wire is a seasonal activity and is only currently available until Sept 9th 2018. Check their site for various packages and concession discount and please if you would be as kind to name drop us “Valuemytime.co.uk” to them somewhere, where is be social media or an email. For more unique things to do in London, check out our packaged tours for all year round adventures in South, East and North London.